We were off to Moaning Cavern (http://www.caverntours.com/MoCavRt.htm) and their zip line, up in the Sierras. Michele Dale, copilot extraordinaire, talked me through the crazy ins and outs of California Route 4. Vince got stuck in the middle seat in back and had a giant wedgie. Grace was in IPod land, and was mostly blissful. James was a happy guy. It was a 2 hour ride, through the central valley, which is all agriculture. The kids were amazed by the fields of corn, tomatoes, peppers and fruit trees. They found it vaguely depressing, since there’s lots of dirt and shacks. When we got to the Cavern, it was 100 degrees in the shade. But it’s a dry heat. There were 2 ziplines next to each other, so the guys were able to go at the same time, and then the girls. No one freaked or barfed. We would have gone again if there were time. But, we were due to take the cave tour. It is a tiny hole in the ground that opens into a deep wide cavern. The Statue of Liberty would fit inside the cave easily. We (AB) had to mind over matter it at the beginning, since it’s a really narrow stairway, single file. A big person would not fit. James: “This would be a bad time to find out you’re claustrophobic.” True that. Then there’s a platform where we got some more info from our guide. After that there’s a spiral staircase made from a WW I battleship down to the floor of the cave. Something like 244 steps. Single file. Spiral. Suspended in the cave. The guide told us that they check it every 45 minutes, which is the tour frequency. Some of us didn’t think that was funny. Vince opted to stay on the platform, concerned about the cavalier attitude of the guide to our safety. 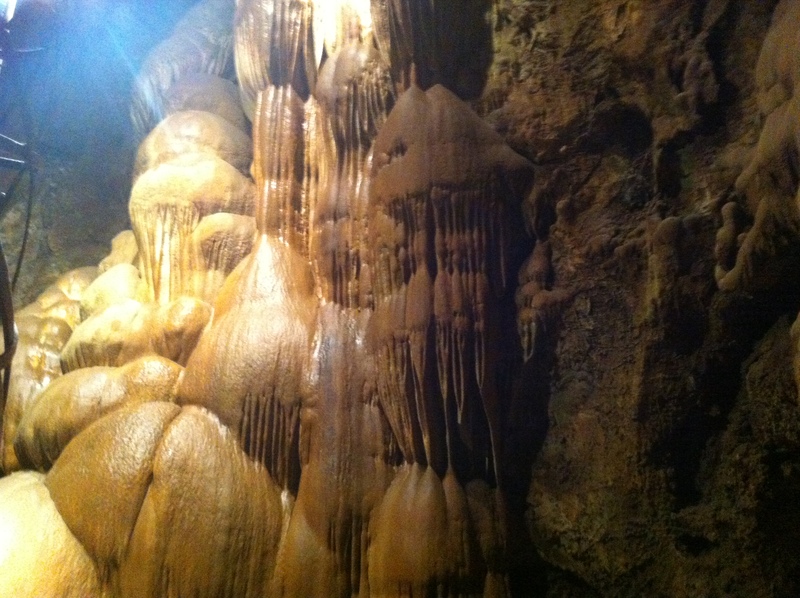 We 4 went down, past giant stalactites and stalagmites. At the bottom, the guide turned off all the lights and lit a candle so we could see it the way the original people did. Freaky! Then he blew out the candle and we were in total darkness. Freakier! Back up the stairs we went. Lucky thing AB is so fit. We were hot and hungry as we headed toward our hotel, Murphys Suites, where they do in fact have free Oreos in the lobby. Life is good. The guys hit the pool, the girls chilled, AB went for sandwiches. 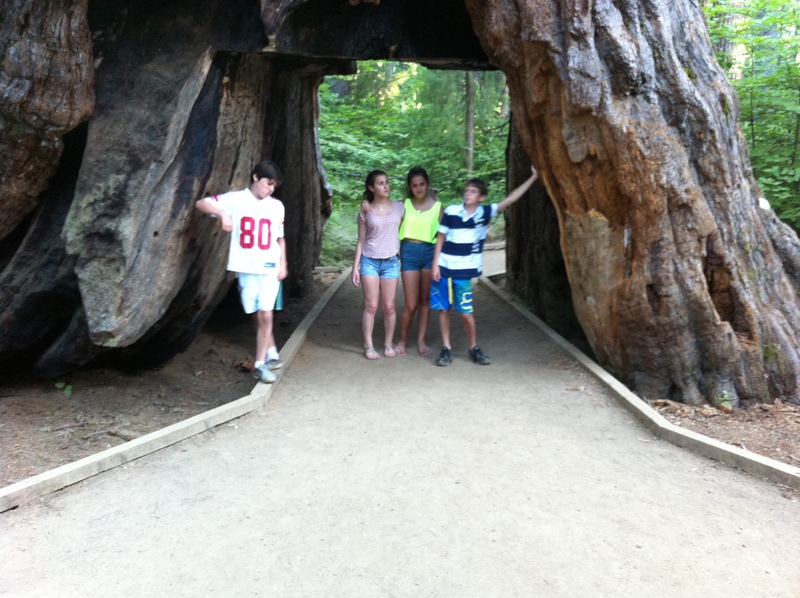 Then we all relaxed a little before we loaded up to see the Calaveras Big Trees (http://www.parks.ca.gov/?page_id=551). 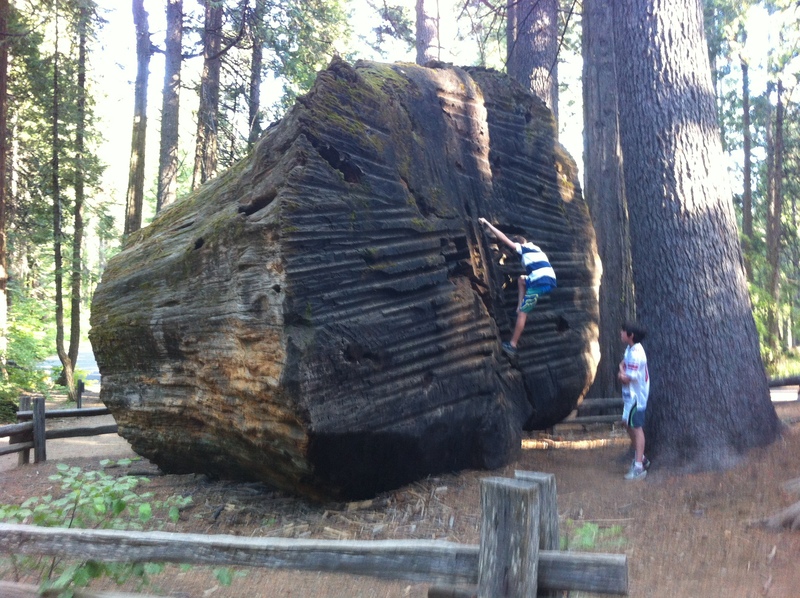 Giant sequoias! 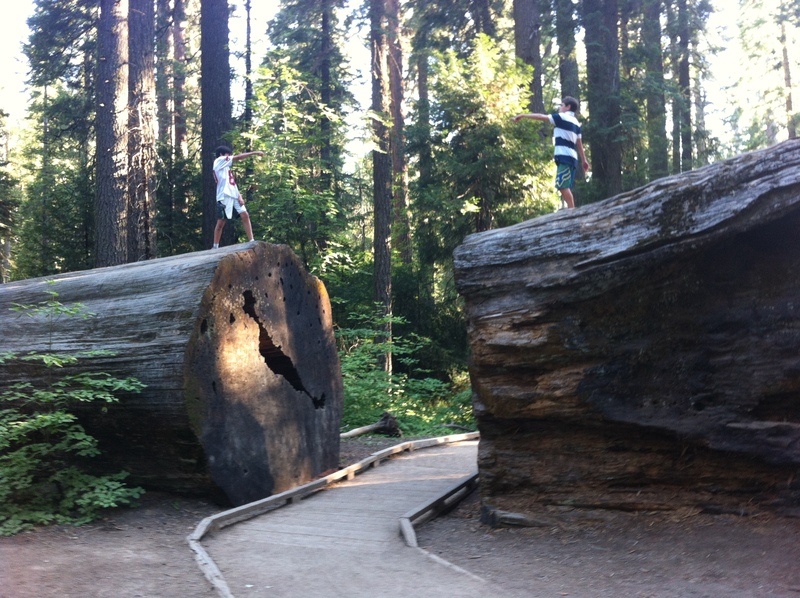 The guys parkoured their way along (and off) the trail. The girls and I strolled and fed the mosquitoes. The kids listened as I read from the trail guide! We did manage some pictures, which I’ll send separately. We stopped in downtown Murphys on the way back to the hotel. They had rolled up the sidewalks, so we had to get ice cream at the supermarket. Ben and Jerry’s hit the spot. Some TV, and sleep.